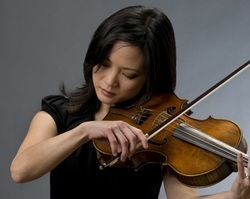 Violist Anna Marie Ahn Petersen joined the Philadelphia Orchestra immediately upon graduation from the Curtis Institute of Music. She has collaborated in chamber music with such luminaries as Christopher Eschenbach, Wolfgang Sawallisch, Yefim Bronfman and Christopher Parkening. Ms. Petersen is a frequent guest at chamber music festivals including the Ravinia Festival, Casals Festival, Seoul Arts Festival, Kingston and Saratoga Chamber music festivals. She has performed as soloist with the Seoul Philharmonic and the Orquesta Filarmonica de Bogota. Her solo debut recital in Seoul, Korea was sponsored by Jeunesse Musicales.